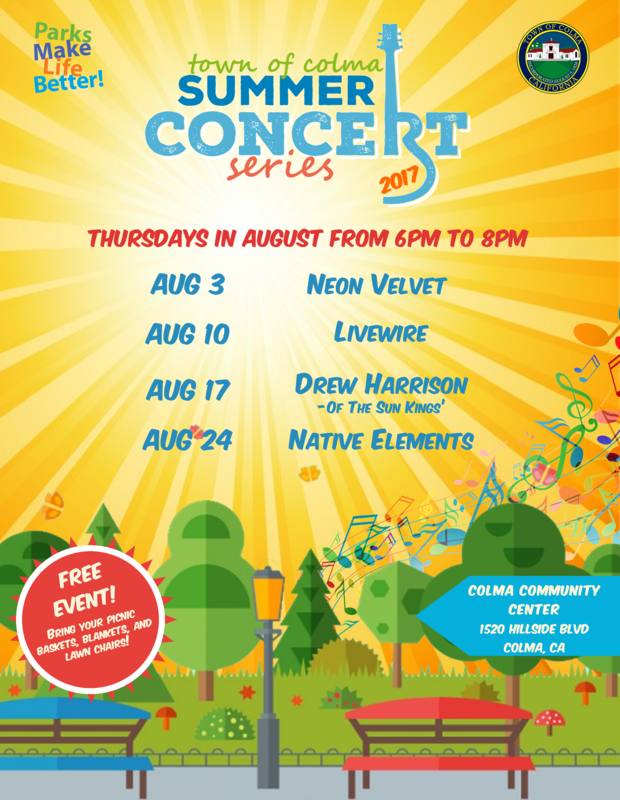 Add to calendar 2017-08-17 00:00:00 2017-08-17 00:00:00 America/Los_Angeles Summer Concert Series Were excited to bring back the Summer Concert Series. Join us in August for four evenings of great music and entertainment. We will gather in the grass area at the Colma Community Center located at 1520 Hillside Blvd. from 6:00pm - 8:00pm. Bring your lawn chairs, blankets and picnic baskets and enjoy a night of music among your neighbors. Were excited to bring back the Summer Concert Series. Join us in August for four evenings of great music and entertainment. We will gather in the grass area at the Colma Community Center located at 1520 Hillside Blvd. from 6:00pm – 8:00pm. Bring your lawn chairs, blankets and picnic baskets and enjoy a night of music among your neighbors. This years line up includes…….